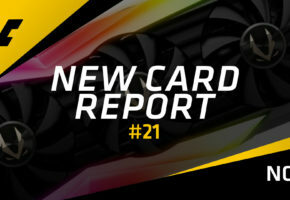 It’s been a while since the last report, so let me give you a list of all the cards that we added to our database in the past two weeks. A card named Wolverine (it’s a direct translation, probably unrelated to the movie “Logan”), is the new GTX 1050 card from ASL. This model ships with reference clocks and 2GB of RAM. It’s a custom PCB with single-fan design. GALAX has three new cards, starting with dual-fan and low-profile GTX 1050 series. Both cards are overclocked, but as you can see the performance boost is just cosmetic. We also have new mini ITX card based on GTX 1070. This model is clocked at 1518/1708 MHz, which is just a tiny upgrade over reference model. Korean Emtek has new GTX 1050 Ti. This model is part of HV GAMER series. It ships with 5% overclocking out of the box. KFA2 has quietly updated its EXOC lineup. At first, you may be confused why there are so many EXOC models, but it’s relatively simple to explain. There are two EXOC series, EXOC and EXOC SNPR. The EXOC SNPR series feature RGB fans and backplate. EXOC SNPR also splits into White and Black editions. So in total there are six EXOC cards, below you can see the EXOC SNPR series, which we added just recently. Japanese manufacturer also has low-profile GTX 1050 series. Since Kurotoshikou GeForce models are mostly based on GALAX design, these cards are essentially the same as the ones you can see above from GALAX. Palit has a new GTX 1080. This model is factory-overclocked to 1620/1759 MHz. It should be considered as a budget-friendly GTX 1080 model from PALIT. Meanwhile, Sappire added two cards. The first one is RX 460 with 1024 cores and the other is RX 480 8GB NITRO OC. We already posted about the first card here. As for the RX 480, this is so far the only RX 480 8GB model with 1750 MHz memory clock. We added 4 new XFX cards to our database. The first one called Patriot Edition is a special edition ‘designed’ for a competition. There are also three new RX 460 cards, with two based on dual-fan design and Polaris 11 with 896 cores, and the latter based on Polaris 11 with 1024 cores. Finally, Chinese ZOTAC added two GeForce models. The GTX 1060 6GB Thunderbolt and GTX 1050 X-Gaming OC.